Galette des Rois is a mainstay of January in France: it’s an Epiphany cake from the North of France (the South has their own Epiphany cakes). It’s meant to celebrate the arrival of the three kings to see baby Jesus, though by now it’s become detached from religious origins and people eat it regardless of whether they’re Catholic or not. 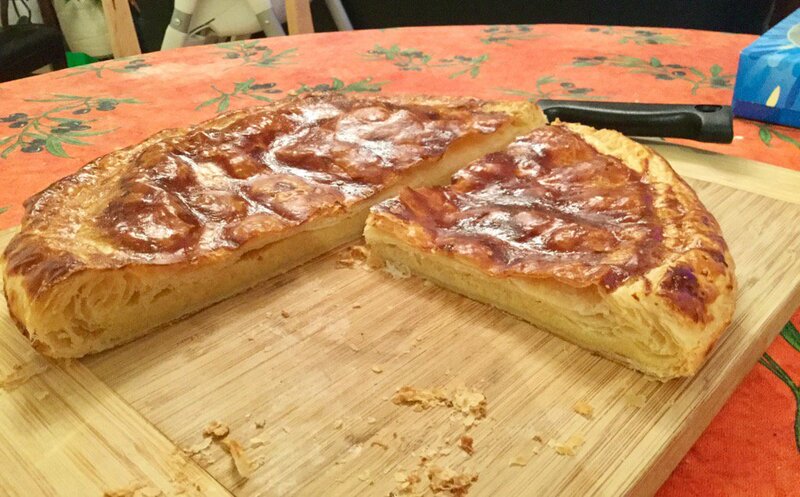 Galette des Rois is basically puff pastry with an almond filling. The main trick to this is making absolutely sure that you seal the space between both puff pastry sheets with egg and that there is no space whatsoever for the filling to run out, otherwise you’re just headed for a disaster where the entire filling becomes liquid and drips out in the hot oven, which means that a. you need to clean the oven and b. you have an empty galette (I’ll leave you to work out which of these two is the saddest occurrence). Puff pastry is… not the easiest thing to make, and in France most people buy theirs pre-made from shops. They come in pre-rolled 32cm-diameter circles. If you can’t source something similar, here are two puff pastry recipes: a quick one and a more involved one (and tips). You have been warned. The fève is a small porcelain ornament that gets baked into the cake, and the person who finds it in their slice is crowned king (and can crown their queen). Basically you’re looking for something small enough that it fits comfortably into a slice, and large enough that it won’t get swallowed by mistake. Technically, to distribute the slices, the youngest person goes under the table, and is asked “pour qui cette part?” (for whom is this slice?) until everyone is served. Interestingly, the Elysée galette des Rois, eaten by the French president, has no fève, because it would be unseemly to crown a king in the power centre of a Republic. Frangipane filling: in a bowl, whisk the sugar with two of the eggs until the mixture has whitened. Add the almond flour, the softened butter, the vanilla extract+sugar and the rum. Mix until well combined. Roll one of the puff pastry sheets to a large circle, roughly 32cm (the ones you buy in shops in France come pre-rolled). Stab it with the tines of a fork a few times. Pour the frangipane filling in the centre and spread it while leaving a 2cm-border free. Add the feve if using. In a bowl, beat the third egg until yolk and white are combined. With a pastry brush, brush the 2cm-border you just left with the egg. Roll the second puff pastry sheet somewhere separate. Here's where it gets tricky: lift the sheet carefully with your hand, keeping it as flat as possible, and drop it on the first pastry sheet + frangipane. The first pastry sheet should be "sticking out" from underneath at all points, so that the egg causes both sheets to adhere to one another. Don't put any frangipane on the border otherwise the egg seal won't work (if this happens, wipe out the frangipane with paper and put more egg). Put more egg on the border area (the bit of the first sheet that's sticking out and the top of the second sheet). Then fold the sticking-out bit of the first sheet over the second one, creating a large border of dough sealed with egg. Press so that it sticks. Brush the top of the galette with the remaining egg. With the knife, draw a grid pattern on the top. Stab the top with a fork around ten times. Cook at 225°C, for 30 minutes, or until golden and risen.